Pricing has a substantial and immediate impact on profitability. Most companies, however, still use costs or competition as their main basis for setting prices. Product or business model innovation has a high priority for many companies, yet innovation in pricing received scant attention until the first edition of this groundbreaking book. This new edition of Innovation in Pricing builds on the success of the first, examining the ways in which pricing innovation can drive profits through cutting-edge academic research and best practice case studies from leading academics, business practitioners and consultants in pricing. a new introduction that makes explicit just what strategic pricing can do for your organization. 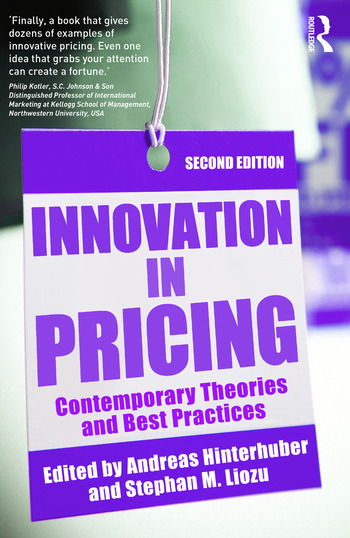 This book is the only book dedicated to innovation in pricing and is an essential read for business executives, innovation managers and pricing managers wishing to treat innovation in pricing as seriously as they treat product, service or business model innovation. It is also valuable supplementary reading for advanced students of marketing and sales. Research on odd prices: dead end or field of potential innovation?